Retractable Awnings and Shades — Cutting Edge Window & Screen, Inc.
Block the harmful florida sun and enjoy the outdoors! A Rainier retractable awning extends your outdoor living space, providing weather protection from light rain or glaring sun. Turn your deck or patio into a relaxing getaway at a much lower cost than a luxury resort. Your custom-built awning will complement your home's color palette and reflect your unique style. Your investment in a quality, long-term shade system, installed by professionals will provide years of comfort and enjoyment. 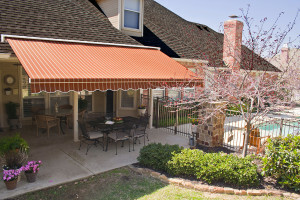 Sunbrella awning fabrics are the designer's choice for quality shade solutions. This durable and low maintenance fabric is fade resistant, mold and mildew-resistant, and bleach-cleanable. Sunbrella awning fabrics deliver the performance you expect, withstanding the elements year after year. Rainier retractable awnings are engineered, designed, and assembled with pride in the USA. We control the manufacturing process and are able to rapidly respond to your sun protection needs. When we say Made in America, we mean manufactured in America not assembled!